How powerful is the book? So powerful it will capture you with the facts from the first page. Ezra is a mathematician that was drawn to spirituality at a young age but only about 15 years ago did he fall in love with the Bible when he discovered its beautiful and unique underlying codes. It was way beyond ELS and he realized that no human or super computer could have created it. He studied the writings of the greatest sages, the Zohar, the Sefer Yetzirah, and Kabbalah on the deepest levels, and many more codes were revealed. Some of them he shared in the book he published three years ago, The Genesis Prayer, since then, he’s gotten deeper yet in his studies and has now revealed to us, The Divine Calendar. You can down load it for free from this site. Just Click on “Nothing Random” at the top..
Have you found any indication of what season of the year 2018 the Messiah will come? It’s not clear. There are many different days supposedly associated with the arrival of Moshiach. All we know is that the arrival (manifestation) is supposed to occur between 5777.78 and 5778.28 and that by 2019 we will be in another time frame entirely. The Sign for this is the Monas-Glyph, made by Dr. John Dee for the Habsburg King Maximilian. It comes from the Merkurglyph, added Aries on the bottom of the cross. So, we have 2 Years from -1 to +1 CE + 5775 = 5777. It means the night 13.9. to 14.9. Rosh ha Shana from 5775 to 5776. That brings us to 5778.
to uspstairs 321 = 18 x 321 = 5778. The year 0 CE in GC ist equal to the year 220 CE. Created 1 CE on 25.3. GC = 25.3.221 CE, there is no difference. It leads us then to 2021 CE. This means for me, that the way downstairs (125 Steps + 1 for the changingpoint) to 2021 overlaps with the way upstairs from 2018 CE. But 2021 CE equals in a computistic sense 1 CE, but the birth of his Mind (Neshama) on 1.1.3760 HC was -1 (2 BCE) an this is analogue to 2019 CE! Those 220 years difference we can find in Anno Mundi Countings too, like 3760 + 220 = 3980 for example. The Christians laid the conception of Jesus as Sungod on 5.4.0 in GC, but on 5.4.220 JC=GC and the conception of his body as Man (AISH) on 25.3.1 GC = 25.3.221 GC=JC. Gregorian Calender equals Julian Calender on 1.3.200 CE. Therefore the Roman Catholic Church date -1511. This was possibly a mistake: They thought 1511 years up to 0 or from -1311 up to 200 CE = 0. The new ERA 1492 CE = 7000 AM (1492 + 5508 Byzantine Era) was 3760 + 1492 = 5252 HC up to 5253 HC (= 5 – 25.3 – Springfullmoon) or 2 x 2626 (YHVH-YHVH, for example). Pingback: Who knew? The Mark of the Beast Really is 666. | Evoking the Light that Reforms! Pingback: Rav Ashlag’s Final Words and the Secret of teh Final Redemption. | Evoking the Light that Reforms! Pingback: Rav Ashlag’s Final Words and the Secret of the Final Redemption. | Evoking the Light that Reforms! Pingback: The Capstone of the Washington Monument is Cracked | Evoking the Light that Reforms! How do arrive at you 422 BCE for the destruction of the first temple? Pingback: It was Recorded Even Before Creation | Evoking the Light that Reforms! 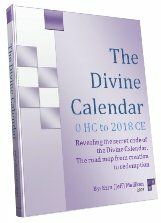 There is another interpretation of the narrative in The Divinde Calendar. One that is not so exclusively Judaeocentric! David Bohm’s concept of the Implicit Order, the Holomovement and all that, describes all time as encoded in each moment of linear time. The 2012 theories span the same time-frame as the Calendar. Two different perspectives. The commonality, the one i intuit from my persepective is of an event unfolding with increasing force toward something indescribable. For everyone. While 2012 is in the general vicinity, it is not specified by either the given calculations, or the mathematics constants, only 5778 (2017-2018) and 2019. Nevertheless, in 2012 Neptune enter Pisces, where it remains for 13/14 years, meaning 2018 is the midpoint of the Spiritually imperative period in which Neptune traverses Pisces (whatever that means.) And yes, we are moving every more rapidly toward a convergence regardless of the historic or religious context. the concept of numbers is off. why i see it this way is the divine calander you are using is wrong. first we must understand to read the holy book like the bible torah tanakh we must first know that we live in a seven day week code. its is 7 days make a week 28days make a month 12months make a year. now if you multiply 12 by 28 a number of 336 will show up. now add 29 to 336 you get 365 so its only 29 more days to understand the reality of the what happen in the creation story. everyone use the hebrew or A to Z alphabeth to find out the secrets of the universe but you will not get your answer to the truth order or snake order we call it. mathematics is the universal language to the angels. we must know their number colours and their names. each one represent a diffrent day of the week today is friday which is gabriel his color is red his number is 76. this is kabbala which means seven light. or knowledge of the angels beyond the boundries of the animal light angel. one must know how to remove him self from darkness to light. 5778-3338 is not = 3330 years, but it should be = 2440 years. Besides this one point I found your book very interesting and could not stop reading it till I had finished it. 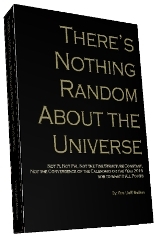 Hope to also read soon “There’s Nothing Random About the Universe”. thank you so much for this divine calendar. may God bless you and give you more as you have freely given. I would like to invite you to weekly Internet TV show on True Psychic Network. Should you find this worthy of your attention would contact me by e-mail. Amazing Book,,, I am little low in Math but trying to understand!!! I wish I have all the Wisdom to understand everything,,, Toda Aba,,,,, Light & Blessings. I am wondering you give the year 1948 as the year that Israel received Statehood. THE COMMANDMENT HAPPENED ON NOVEMBER 29, 1947. The treaty was signed in 1948, so why is not the date of 1947 used??? That was when the commandment came forth.